Parkside Mediahouse is ideally located just off Birmingham's outer ring-road, just a few minutes drive the M6, but walking distance to the city centre. As a purpose-built media production facility opened in 2013, Parkside Mediahouse provides excellent, on-site access for vehicles and equipment. There is a large, multi-storey car park on-site, and parking is also available for outside broadcasting and technical vehicles. Located close to Birmingham city centre, the facility is just 15 minutes walk from Birmingham New Street Train Station, and 10 minutes from Moor Street Station. Fast trains from London Euston to Birmingham New Street station are around every 20 minutes, and take around 1 hour 25 minutes. By 2030, Parkside Mediahouse will face the new Birmingham Metropolitan station, the central hub for the new high-speed 'HS2' rail link. 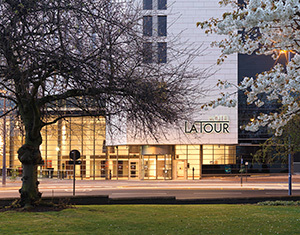 Less than five minutes walk away from Parkside Mediahouse, through the new Eastside City Park is Hotel La Tour, a '4-star hotel located in the heart of Birmingham city centre'. Also close-by in the city centre, there is a huge range of high-quality hotels, restaurants and bars to cater for all budgets. Our team will always be happy to recommend our favourite nearby restaurants and bars to you. If you have any more questions about getting here, nearby resources, or just want a chat, please get in touch!